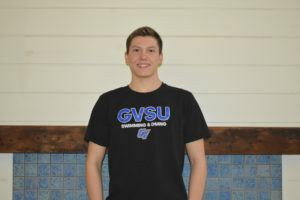 Callaway Grainer is ready for the future after announcing he will continue his swimming career at Grand Valley State University on the 2019-2020 Swim and Dive team. “I want to keep swimming in college because I like how the sport keeps me in shape, helps me manage my time and school work, the teammates become your best friends and becoming a better swimmer overall,” said Grainer, a senior at Clarkston High School. He chose GVSU because he enjoys the school and has gone to the campus many times while visiting his sister. He plans on going into business and will pick a specific field after learning more about the different aspects in his general classes. Grainer began swimming in first grade and still remembers when his classmate, Logan Knowlson, invited him to swim with the Clarkston Sea Wolves. He continued swimming with Great Lakes Aquatics, Lake Orion Liquid Lightning and OLY. His advice to other athletes is be prepared to put in the time and work hard for what you want.